Swim: This is .9 mile swim and I'd like to do it in 40-45 minutes. If I'm slower than 45, I will feel bummed. If I'm faster, well...woot! Bike: It's about 25 miles and I don't bike fast. 4 minutes a mile is probably as fast as I can reasonably do, and that's a 1:40. It's probably more likely that I'll be at 5 minutes a mile for a 2:05 bike leg. So if I can finish under 2 hours I will count it a success. Run: I love running and this is a 10K. Last fall I ran a 46:17 in the Great Race 10K. That's not likely in this event, but I'd like to think I can roll in under 60 minutes. If I can come in under 54 minutes (slightly faster than 9:00/mile pace) I'll be really happy. So there you have it: slowest finish time around 220 minutes (3:40 minutes) and fastest could be 190 minutes (3:10 minutes). I did it - I am a Steelman Olympic Finisher! My finish time was 3:18:18 and though the race was hard I can honestly say I enjoyed every stroke, pedal and step. We arrived at Lake Nockamixon early before the sun was up and parked down by the marina. I listened to some of my favorite training songs on the drive there. I was feeling nervous but good. No injuries, no moments wondering if I had trained enough. I had attended the pre-race meeting the day before and driven most of the bike course. I had a decent night sleep and had visualized how I would feel during the race. I even had a specific mantra or positive thought for the swim, bike and run portions. As I entered transition I got my body markings. The racks were already pretty crowded and I actually had to move someone's bike down a bit to make room for my stuff. Six bikes to a rack ladies! Don't take up all the space! Time passed quickly and soon I was squeezing myself into my wetsuit and heading to the water. I had some last minute nerves, wondering if I could really do this - then I shook it off and stepped into the water. It was about 76 F, truly a perfect temperature. We started in the water at a buoy a few yards away from shore - and when the air horn sounded I just took off. It was incredible. Usually I spend the first few strokes alternating breaststroke and freestyle, but this time I did freestyle the whole way. I was cruising comfortable and strong. I actually enjoyed the swim. This from a woman who cried in open water just a month earlier. Even getting punched in the googles and the back of the head didn't slow me down! I finished the swim in 35:53! Quite an improvement from my 47 minute mile swim back in July. Even my husband said I was coming out of the water quicker than he expected. 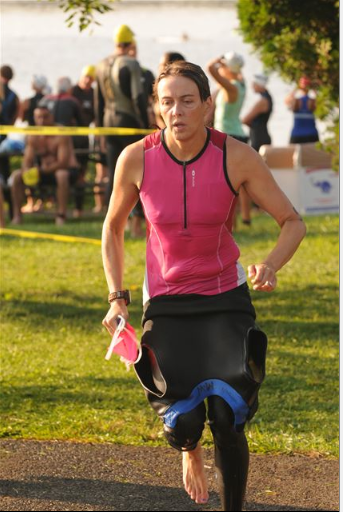 After the swim I chugged down the chute into T1 and stripped off my wetsuit and donned my bike gear. I knew I wasn't going to break any speed records but I wanted to maintain a decent pace. The bike was mostly uneventful with me gliding easily up the hills and braking on the downhills. I learned about false flats and tried to stick to my hydration and nutrition routine. Even though the road was closed I stayed on the shoulder and I was surprised so many people were passing me on the right. Maybe I wasn't over far enough? This was the largest race I've ever been in and the combined field of Sprint and Olympic races made it pretty crowded. I was cautious. A big worry was the two speedbumps that were installed on the course about two weeks before the event. I was able to avoid the first but hit the second with only my back tire in a strange clumsy move. My bike time was 1:46:02. That was the slowest time in my age group for this year's event AND last year's event. But that time is still closer to the faster goal in my range, so I am going to be satisfied with it. Frankly I was pretty happy to be finished the bike leg!! Getting off the bike in T2 was a relief and I quickly popped on my running shoes, removed my helmet and put on my hat (and tucked the inner flap out of sight). I briefly asked a woman who had finished ahead of me how the run course was and she warned me "There are some hills." Ok, I thought. I run in Pittsburgh. I'm ready for hills. But frankly those hills never materialized. There may have been some minor rollers but nothing like what we run on out here. What tripped me up was not knowing the course. I knew there was a 'turn-around' but I didn't understand I'd do that turn-around twice. So the mile markers threw me off at first. But soon enough I figured it out and settled in. I was really happy with my mile splits as they stayed between 8:19-8:24 but a new and nagging pain in my left ankle bothered me. And then I got hot, dry goosebumps. I had been drinking as much as I thought I could but it probably wasn't enough. My mile splits slowed to 8:50 and 9:05 and my run time was 51:53. I told myself before the race that sub-54:00 would be a success, so I have to keep telling myself that and stop thinking "wish I'd gone under 50!" When you cross the finish line at Steelman, they put an icy cold towel around your neck - that was incredible. I highly recommend it. I was really, really happy to hug my husband. 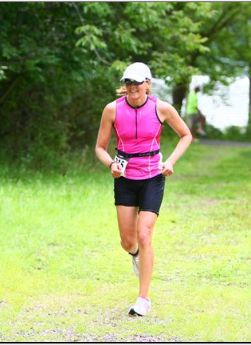 I could not stop smiling after the race and was really proud of my effort and accomplishment. I missed celebrating with my coach who had been injured pretty bad coming out of T1. And I wished my kids could have seen me, but I was so happy to have my husband there cheering me on. Overall, I was 21 out of 26 women in my age group. Out of the water, I was in 343 place and off the bike I was in 390. But after the run I knocked that down to 209th place! 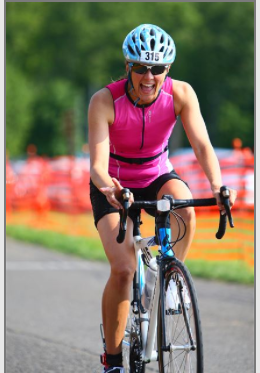 There's plenty of room for improvement in the bike leg and I hope to get stronger in the swim and run, too. Now I'm just looking for the next race on the calendar.